BofA: This Is "The Last QE Trade"
Last week we reported that shortly after the biggest equity fund inflows on record at $43BN, retail investors were whipsawed and amid the latest spike in market vol which sent the VIX back over 20, yanked a "huge" $19.9BN in cash from equity investments, of which the $18.6BN in equity ETF outflows was the second highest on record. And while last week may have been shortened by one day thanks to Easter, the volatility remained with US equities subject to increasingly greater swings in both price and sentiment. 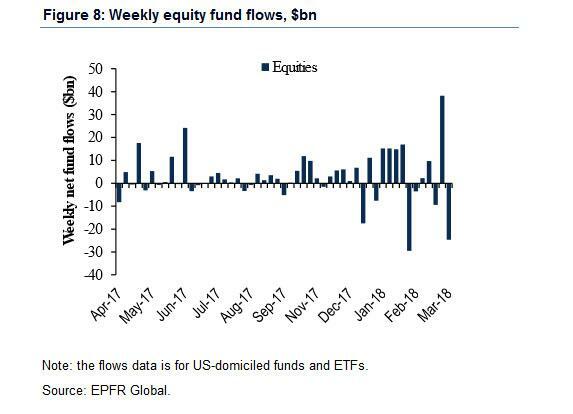 As a result, according to BofA, equities closed off the quarter with another "huge" week of outflows, led by $13.1BN pulled from equities ($10.6BN from ETFs and $2.5BN from mutual funds), as well as $2.0Bn in bond redemptions. It is worth noting that already some 22% of the record YTD inflows into equities have now been unwound. With the sharp recent reversal in sentiment, it is hardly surprising that Q1 saw the first quarterly loss in the S&P 500 since 2015 and the first quarterly decline in the FTSE All World index since the start of 2016. And while the US was once again the focus of selling, it was not all doom and gloom. 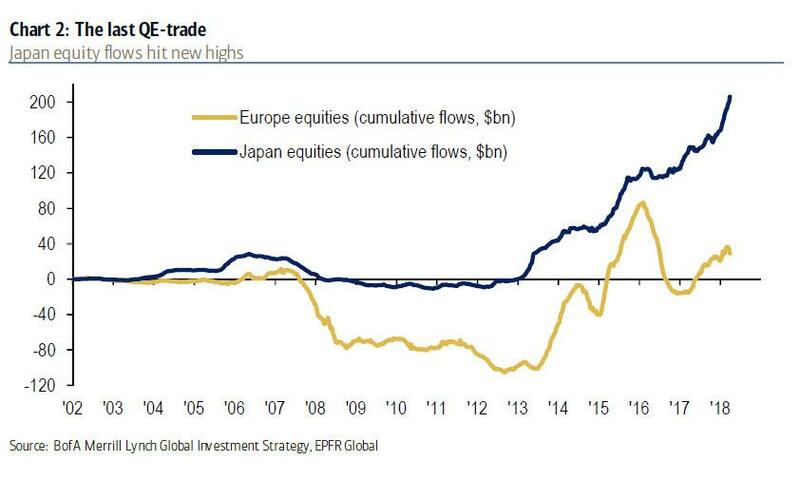 In fact, in what BofA's Chief Investment Strategist, Michael Hartnett, has dubbed "the last QE trade", Japan registered the second biggest inflows on record of $5.8bn & annualizing record $149.3bn inflows for 2018 as investors scrambled into the safety of the only central bank which has not given any indication it will be tapering any time soon. According to the FT, it is likely that local Japanese investors took profits on overseas holdings, bringing the money home ahead of the end of the fiscal year on March 31. EPFR Global said most of the cash into Japanese equity funds was yen-denominated, while recent strength in the yen would also have made such a move attractive. What is bizarre is that this flood into Japan counter-intuitively also coincided with testimony in a cronyism scandal involving Abe’s government: Nobuhisa Sagawa, an ex-finance ministry official, said the decision to alter documents about a sale of public land was made by his staff alone and there were no orders from Abe, his wife Akie Abe, finance minister Taro Aso, or any of the prime minister’s aides (some have said Sagawa was clearly lying to protect his former bosses, potentially under duress but so far there is no proof of that). “It is a respite,” said Max Gokhman, head of asset allocation at Pacific Life Fund Advisors, adding that the scandal was “an ongoing issue”. 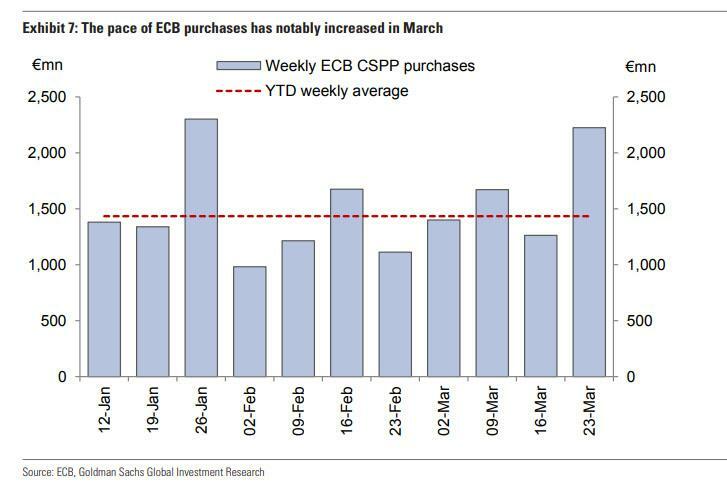 Perhaps the explanation is far simpler: the BOJ simply stepped in, guns blazing, and bought everything it could... just as the ECB did last week with European bonds. Sure enough, on Tuesday, the day of Sagawa’s testimony, the Topix index added 2.7%. In contrast Europe inflows rolling over with biggest outflows since July 2016. In spite of big losses for big tech companies such as Facebook and Google’s Alphabet in March, tech funds saw net inflows of $500m each in the past two weeks. Concerns ranging from online privacy and Donald Trump’s opinion on Amazon have halted a rally in the shares of large tech companies that has been a pillar of the US bull market in equities. 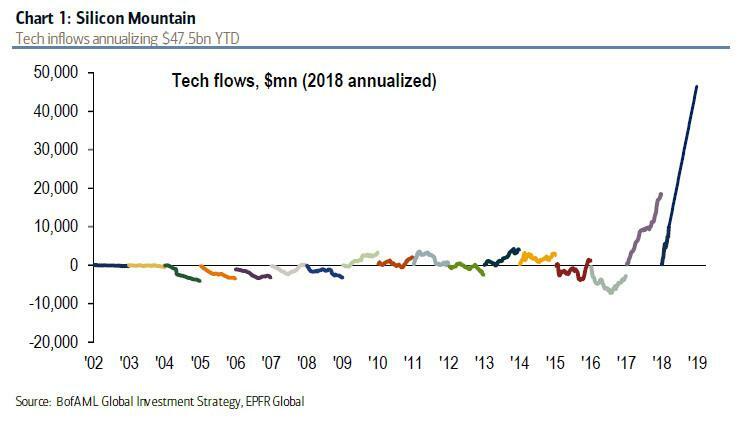 ... is now off 11% from March peak "as Occupy Silicon Valley policy drumbeat gets louder" still, Hartnett notes that the $18bn inflows in past 6 months dwarf $5bn prior 15 years. Tech also represents another key danger to the market as the vulnerability of leadership in the equity sector remains: there are just 5 "sells" out of 250 FAAMG recommendations, and "at March peak market cap Facebook ($541bn) > India ($462bn)" (see:"Hedge Fund CIO: "The Market Generals Are Dead"). 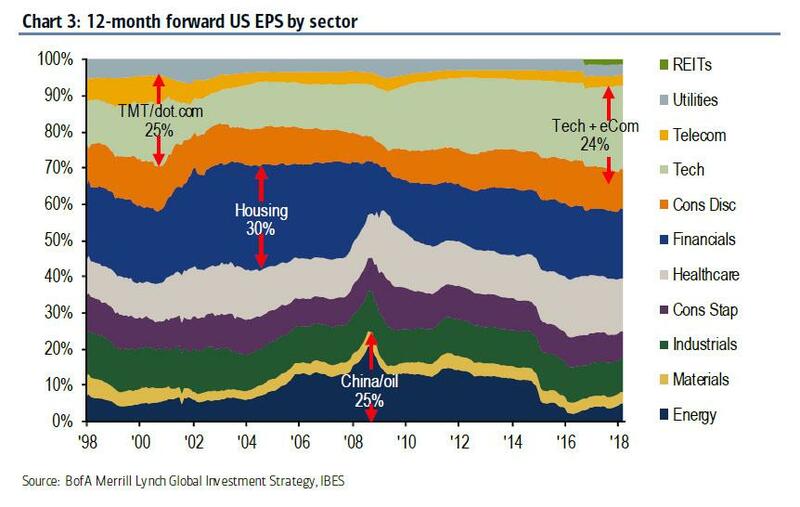 Furthermore, at 24%, the tech share of US EPS has rarely been exceeded. Meanwhile, the pillar that has been carrying equities for years (courtesy of cheap debt-funded buybacks) appears to be cracking as bond funds took a $1.9bn hit in the latest week. 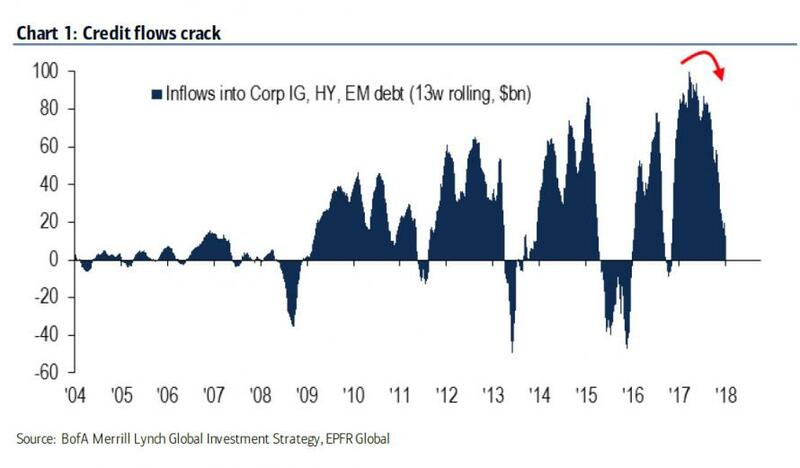 In fact, as BofA points out highlighting the "crack in credit", we just saw a "rare week of outflows across IG, HY & EM debt; in contrast 10th straight week inflows to Treasuries." This is a classic risk-off move, or as Max Gokhman said, commenting on the interest in short-term government debt, "I would look at that as straight-up de-risking. 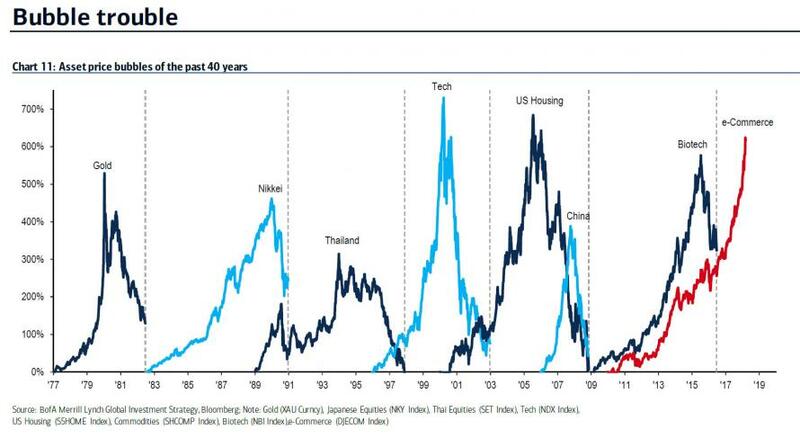 People may see short duration [assets] as a safe haven given all the recent volatility."